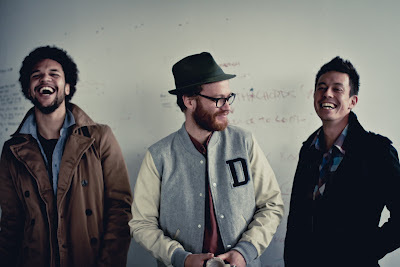 New Zealand band, Electric Wire Hustle make contemporary soul music. Using loops, samples and break-beats along with live instrumentation they create a lush musical landscape that their, D'Angelo-like vocalist makes his home. You can't quite pin-down the genre of music that Electric Wire Hustle creates because it is heavily influence by a jazz, soul, R&B, hip-hop and electronic sounds. All you really need to know is they make jams that you need to sing along to in the car or soundtrack your love making with or both. So far, Electric Wire Hustle have one full-length LP under their belt, which is available via BBE Music with or without vocals. They have been back in the studio since the 2010 release of their eponymous LP so I would expect their sets at SXSW to be a blend of released and unreleased material. I would expect showcase details for SXSW 2012 to be revealed later this week or early next week. In the meantime I'm still just spouting conjecture about where you MIGHT catch Electric Wire Hustle at this year's festival. I know that the folks over at Okay Player are big fans of EWH so you might find them performing at one of their showcases. Other than that if BBE Music has a showcase they'll definitely be playing there. For unofficial listings check Show List Austin, Do512 and SWShhh. I highly recommend you listen to the full, eponymous, album from Electric Wire Hustle as soon as possible. It's available on Spotify but I have yet to see it in physical form in the real world away from my computer. Personally, I would love to grab a copy on vinyl but I have a feeling that won't happen in the near future. Hopefully, they pick up U.S. distribution at the festival and we'll only have to wait until later this year but only time will tell.